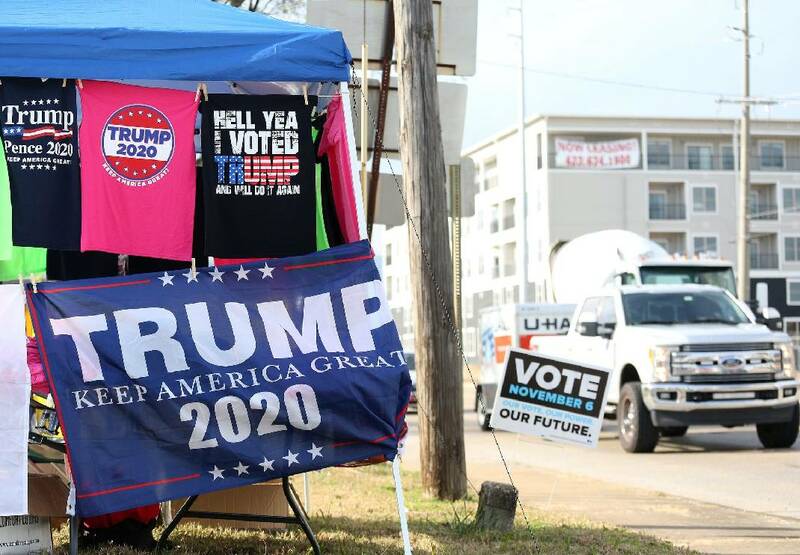 Traffic flows past a booth set up selling pro-President Donald Trump merchandise at the corner 20th Street and Broad Street Wednesday, October 31, 2018 in Chattanooga, Tennessee. Trump will be in town Sunday for a rally. Roads will be closed, lines will be long and Donald Trump's large conservative base in Tennessee will be exuberant as Chattanooga welcomes a sitting president for the first time in five years. Donald Trump and Vice President Mike Pence are expected to attend a rally at McKenzie Arena on the University of Tennessee at Chattanooga campus Sunday evening, marking a rare joint appearance for a sitting president and vice president. Trump is on an 11-city, eight-state "Make America Great Again" tour over six days leading up to Tuesday's election. Trump and Pence are expected to urge attendees to vote for Republicans Marsha Blackburn — running for Bob Corker's U.S. Senate seat — and Chuck Fleischmann — the U.S. representative for Tennessee's 3rd District. Blackburn is in a hotly contested race with former Tennessee Gov. Phil Bredesen. It is the most expensive political race in Tennessee history. Two divisive issues will likely be at the center of Trump's speech. The president has said Tuesday's elections are going to be about "Kavanaugh and the caravan." The two politically-charged discussions surrounding the confirmation of Supreme Court Justice Brett Kavanaugh and a migrant caravan slowly making its way through Central America have gained national attention. In his previous visit to the Chattanooga area, Pence praised the economy and direction of the country before warning that a strong Democratic showing in the elections could mean an impeachment attempt by the party against Trump. Trump will be the third consecutive president to visit Chattanooga. Barack Obama came in 2013 to discuss a tax deal he said would simplify the tax code for businesses and create good paying jobs. George W. Bush visited in 2007 to talk about health care. He stopped at Erlanger and then went to Porker's Bar-B-Q to eat ribs. A cool morning will open to clear skies throughout the day as temperatures are expected to reach the upper-60s, according to WRCB meteorologist Brittany Beggs. Morning temperatures will be in the mid-40s with little wind. It is not expected to rain throughout the day, she said. "There's a small chance of rain late, late Sunday night, but overall the weekend for Trump's visit and the Head of the Hooch looks to be very nice," Beggs said. In the city, all streets between East 3rd Street and Vine Street, and from Lindsay Street to and including Palmetto Street, will close to all traffic at 10 a.m.
Campus parking will be limited and is first-come, first-served. Travelers flying from the Chattanooga Airport could experience delays due to the arrival of Trump and Pence. Flyers are being asked to check with their airline companies for more information.